I happened to be at A.C. Moore one day and I stumbled across a bin of home decor fabrics labeled “$6 per piece.” I dug through and found two pieces of a gorgeous brown patterned upholstery fabric. 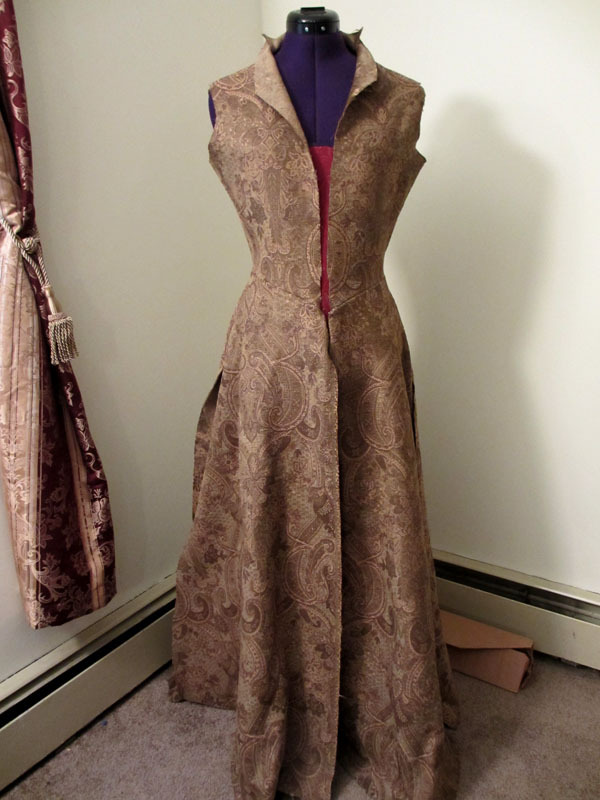 Each piece was only 2 yards, and I was hoping I could find a third piece to have at least enough fabric to make an Elizabethan gown, but all I could find were the two pieces, for a total of four yards. I bought them anyway, hoping I could find something to make out of the fabric. 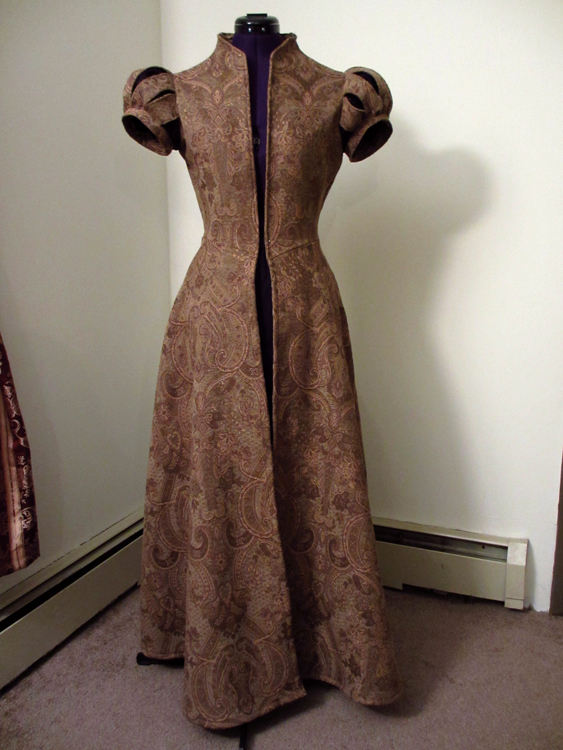 When I got home and checked The Tudor Tailor, I discovered that Fitted English Gowns only need four yards (you’ll notice my header is a photo of the fabric with my copy of The Tudor Tailor). 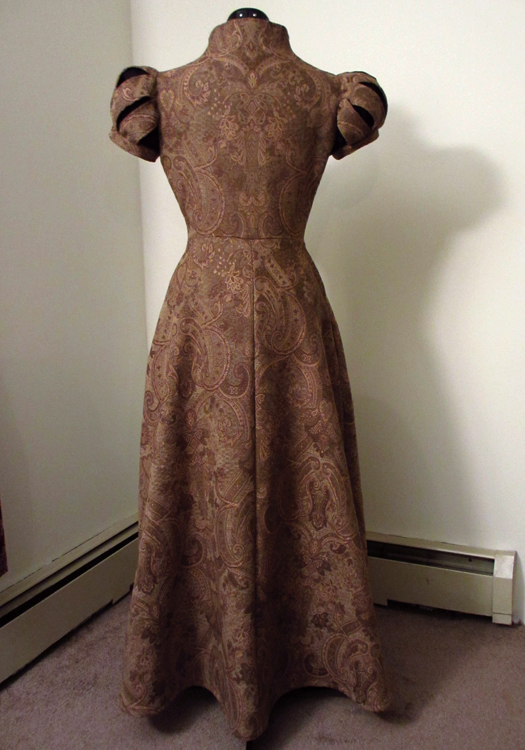 The print of the fabric would have been used in a much later time period than Fitted English Gowns were commonly worn, but I felt that the fabric needed to be a gown, and whether accurate or not, I thought a Fitted English Gown in that fabric would look marvelous. The progress was easy, until I got to the sleeves. 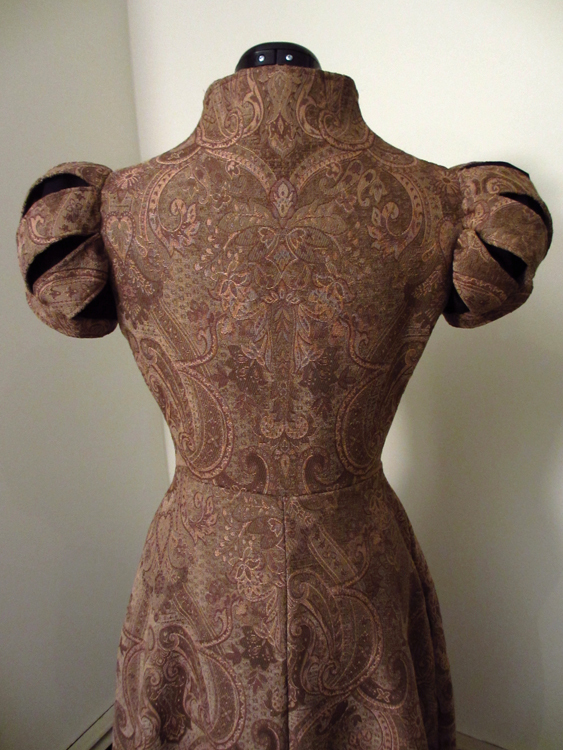 The sleeves took twice as long as the entire rest of the gown. 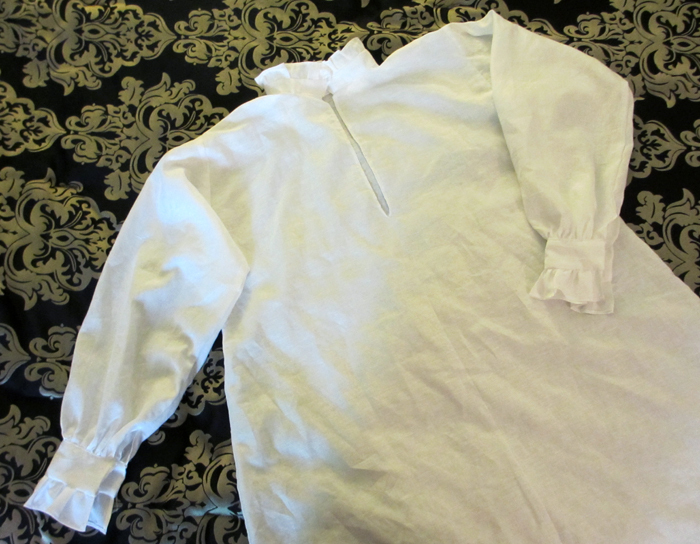 Although the instructions in The Tudor Tailor say to gather the sleeve panes in order to attach them to the shoulders by cartridge pleating, the fabric is so thick that after finishing the edges of the panes, they didn’t gather well, and gathering would have meant that they didn’t circle the entire sleeve anyway, so I only gathered enough to fit them nicely around the armscye. The result is acceptable, I think. 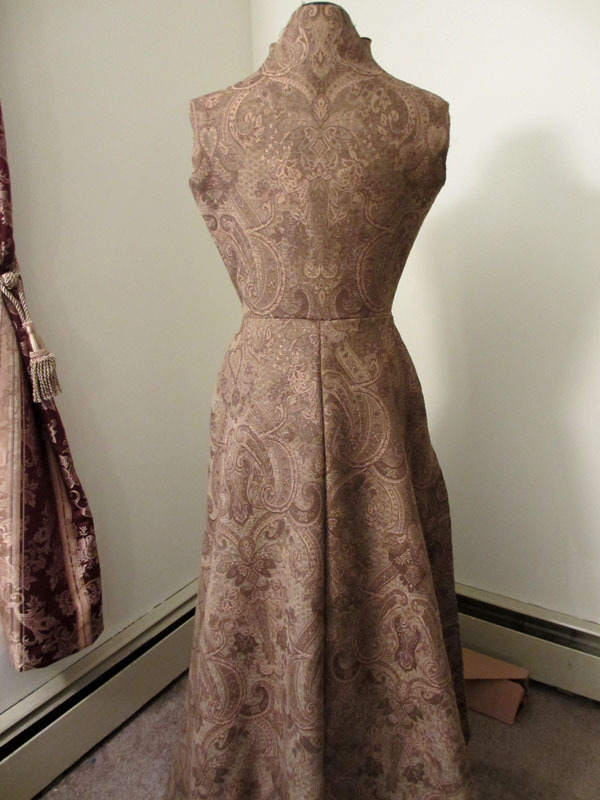 In order to begin making the ensemble complete, I bought three yards of a cotton-linen blend in white. 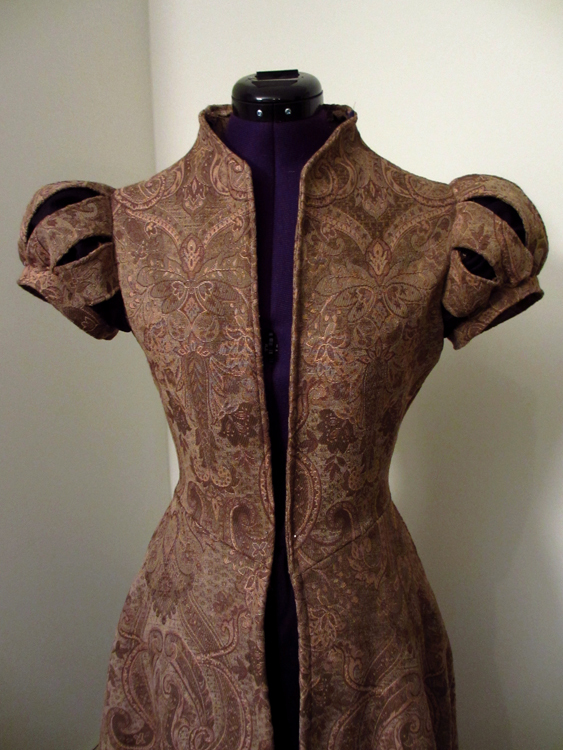 Again I used a pattern from The Tudor Tailor. While making the sleeves, collar, and ruffles, I made the mistake of cutting out all of the strips at once and only once I had the collar attached did I realize that I accidentally used the two wrist ruffles for the collar part instead of using the strips that I had cut for the collar. 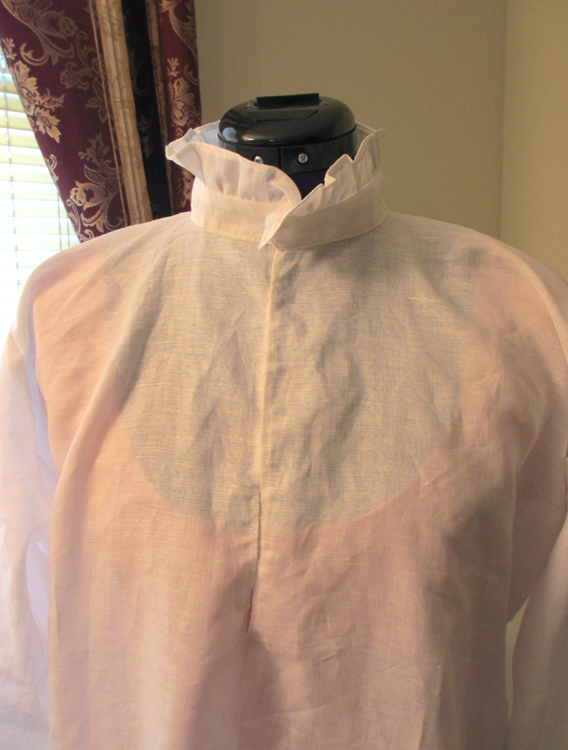 As a result the collar is a bit too long for the neck, but hopefully not noticeably. To complete the outfit, I still need to make a kirtle and sleeves, but for now I’m wearing these two pieces with a skirt from another outfit to a new Renaissance Faire in my area. Hopefully I can get some good pictures to post!